Oberheim Digital Polyphonic Sequencer advertisement from page 9 of Keyboard Magazine September 1982. Oberheim really got a lot of mileage out of their original two-pager DSX/DMX advertisement. That original ad ran through the second half of 1981, and then the left half of that ad became the strong base for the first DSX ad which ran during the same time period. 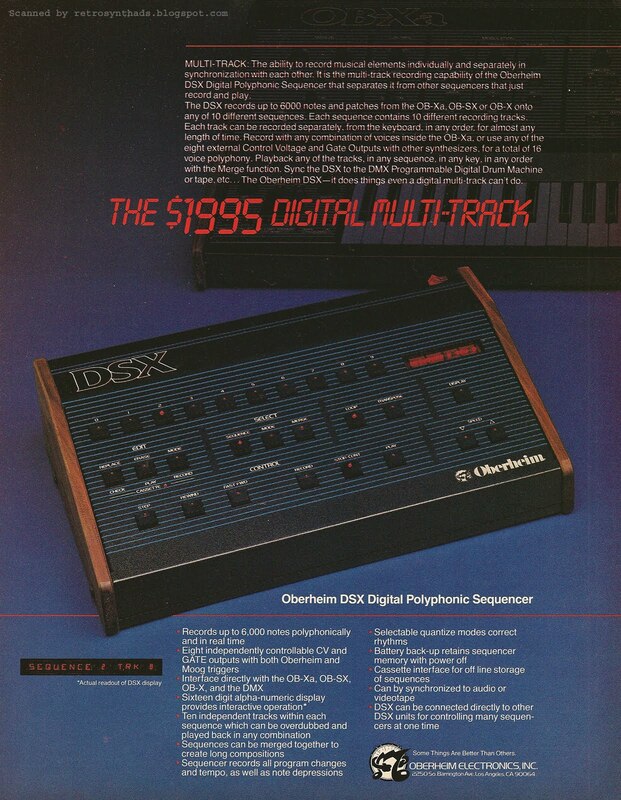 The DSX then took a break from solo advertising (it still appeared every now and then as part of Oberheim's "The System" ads in the first half of 1982), before appearing in this second solo DSX advertisement which again used the same backdrop, running sporadically through the second half of 1982. Although it shares much in common with the original solo DSX ad, the overall theme of the ad did change. 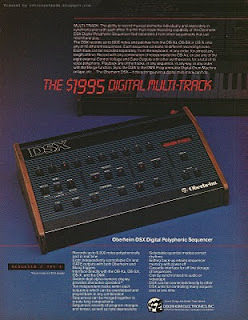 In this ad, Oberheim decided to really hammer home the idea of the 'digital multi-track'. My thinking is that there were probably more than a few musicians at the time having trouble wrapping their head around the idea of recording, editing, and overdubbing note events rather than actual sound, so Oberheim applied the concept of the already-familiar multi-track recorder to make it more familiar. It looks like Oberheim also did something you rarely see today. They hiked the price of a year-old product almost $300, from the original list price of $1,700 to $1995. Sign of the times, I guess. If you recall in my last blog post, I ended it with a promise to provide some of my research on how the different pieces of the Oberheim system fit together to sync everything up. My first few feeble attempts to look for info took place mostly on YouTube and in forums, and I didn't come up with much. But then it hit me... look for manuals! I quickly found an August 1982 manual for the DSX at soundprogramming.net that would have come out right before this advertisement started - so this advertisement was probably tapped to deliberately run right after a new software update came out! And that manual explains plenty. Basically, the Oberheim DSX sequencer is "the cornerstone of The Oberheim System", and the user connects all their compatible synthesizers and drum machines to it. Not really different from hardware sequencers of today. Just different types of connectors. "In the same way that your Oberheim X-series synthesizer remembers the sounds that you program into it, the DSX remembers the notes that you play on the keyboard. The DSX does not record sound, but only keeps track of which keys you played when. When you play back your recording on the DSX, the DSX performs those notes on the synthesizer the same as if you were playing the keyboard." And the back of the DSX is where all those connections are. MATRIXSYNTH has some good photos on the back (and front) of the Oberheim DSX on his Flickr stream. I used that hyper-linked one as my visual map while scanning the manual. If you've kept the MATRIXSYNTH photo displayed in another browser window (Shift-click on the link), the big blue connector in the photo is the computer interface. A cable provided with the DSX links up your compatible Oberheim synthesizer - the OB-Xa, OB-SX, and OB-X (after serial number 803600). And later, the OB-8. The manual explains in very simple terms how the cable allows the computer in the synthesizer to communicate with the computer in the DSX. "You may notice that the lights on your synthesizer flicker slightly when the DSX is connected. This is a function of the two microprocessors talking to each other and is normal." Nice! Its like on Star Trek when all the ship's power is being diverted to the shields, causing all the lights on the ship to dim. "The DSX and DMX have been designed to operate in sync with each other. When the DSX runs in tandem with the DMX or another DSX, one unit must be the master and the other the slave. Hookup: Use a cable with a 1/4" phone plug at each end, connect the CLOCK OUT jack on the rear of the unit to be the master to the CLOCK IN jack on the rear panel of the unit to be the slave". "The clock in the DSX requires 96 pulses per quarter note in order to achieve its high resolution, therefore a click track or a clock from an analog sequencer will most likely not be fast enough to drive the DSX properly." These outputs are located across the bottom of the back panel of the DSX, and allows the DSX to control "any synthesizer with 1 Volt/Octave Control Voltage and Gate Inputs (Oberheim or Moog)". "They may be used individually with monophonic synthesizers such as the Oberheim OB-1, and/or in combination to control polyphonic synthesizers such as the Oberheim Eight-Voice and Four-Voice." Controlling a voltage controlled filter with one CV, and it's frequency with a second CV. I know the CV/Gate functionality was always there, but for some reason, I've always thought in my head that this whole system was a truly 'closed system'. You can actually control any other compatible CV/Gate synthesizer! And we're not just talking Oberheim synthesizers. The manual specifically mentions using the DSX with Moogs. "Oberheim synthesizers use a gate pulse that goes HIGH (+10 volts) when gated. Moog synthesizers use a gate pulse that goes LOW (0 volts) when gated (S-Trig). To use any of the GATE OUT with Moog synthesizers, it is necessary to change the polarity of the gate. This is easily done..."
"Eight independently controllable CV and Gate outputs with both Oberheim and Moog triggers." It was rather rare to see one company use the name of a competitor in an advertisement in any industry, unless the company was slagging them. But Oberheim knew that by mentioning the DSX's compatibility with Moog would be worth it. And, anyways, it couldn't hurt Oberheim's brand. I think both companies were associated with 'quality products' in the minds of musicians.